One of the most energetic players of his era, Jimmy Austin was a sparkplug for the New York Highlanders and St. Louis Browns over an 18-year career spent entirely in the American League. A speedy switch-hitting third baseman, Austin stole at least twenty bases in each of his first six major league seasons, and he was regularly among the league leaders in sacrifice hits. What he lacked in stature, the 5' 7 1/2" 155 lb. Austin made up for in hustle, leading his manager with New York, George Stallings, to give Austin the nickname "Pepper." Even during his coaching tenure with the Chicago White Sox in the 1930s, Austin was still known throughout baseball for being vocal and jumping around with the energy of a young man. In fact, one contemporary sportswriter reflected that, "If pepper had not been discovered some years before James Austin was born, those who know him well would have been prone to assert that the condiment was named after 'Jimmy' instead of 'Jimmy' being named after it. He surely is the essence of pepper." James Philip Austin was born on December 8, 1879 in Swansea, Wales. His father, Alfred, was a shipbuilder who decided to come to the United States in 1885 in search of higher wages. Alfred Austin began work with the Cleveland Shipbuilding Company, and he was able to bring his family to Ohio in 1887 once he had saved enough money. Unlike many future major leaguers, Jimmy didn't see a baseball game until he was 14 years old. Although he had initially wanted to teach his young friends the game of rugby, Jimmy said later that, "I forgot all about rugby in my eagerness to learn how to catch and hit a baseball." Soon, Austin formed a team of neighborhood kids who were eager to play. The team called itself the Franklin Athletic Club, and, while playing against other neighborhood teams, Jimmy first tried switch-hitting. Austin was the shortstop on the team, while Dode Paskert, who later starred for the Philadelphia Phillies, was an outfielder. After finishing school, Austin went to work as a machinist-apprentice at Westinghouse in Cleveland. Shortly after his 4-year apprenticeship ended in 1903, however, the union went on strike, leaving Jimmy without a job. In a stroke of luck, Austin was soon approached to play independent league ball in nearby Warren, Ohio at a salary of $40 per month. In need of work and hoping to follow in the footsteps of fellow Clevelanders such as Ed Delahanty and Tommy Leach, Austin jumped at the opportunity. Jimmy recruited Paskert to play with him, and the two were teammates with the Warren team. In the spring of 1904, they were both offered the opportunity to play organized baseball with Dayton, Ohio of the Central League, on the strength of a recommendation from a traveling salesman with the White Chewing Gum Company. The following year, Austin switched to third base, the position he would play in the major leagues. In 1906, Austin stole 59 bases for Dayton, and the next spring, both Austin and Paskert were picked up by the Atlanta Crackers of the Southern Association. Paskert went, but Jimmy asked that he be sent elsewhere because he didn't like Atlanta's intense summer heat. Austin was shipped to Omaha of the Western League, where he stole a total of 160 bases over two seasons and caught the eye of the New York Highlanders, who purchased his contract following the 1908 season. Jimmy made his major league debut with New York on April 19, 1909 at the advanced age of 29. Despite his age, Austin played with the joy and exuberance of a younger man. His love for the game was so infectious that it even won over the veteran whose job he was trying to take. As Austin later related in Lawrence Ritter's The Glory of Their Times, Kid Elberfeld treated him well even though Austin was competing for Elberfeld's third base job. When Elberfeld was suspended and Austin replaced him at third, Jimmy continued to sleep in his upper berth on the train, normally reserved for the substitutes. Elberfeld, according to Austin, would have none of it: "Put the youngster down in a lower berth," Elberfeld ordered. "Take mine if you have to. He's playing every day, hustling like the devil out there, and he needs his rest." Austin's hustle helped him steal 30 bases during his rookie year with New York. It was during this time that manager George Stallings gave Austin the nickname "Pepper," which took on other formulations over time, including "Pepper Jim" and "Peppery Jimmy." During the 1909 season, Austin also appeared in what is perhaps the most famous baseball photograph of all-time. Jimmy was the third baseman sent sprawling by Ty Cobb in the photograph, taken at Hilltop Park by photographer Charles Conlon, that has since been published thousands of times. "Jimmy and I were very close friends," Conlon later wrote. "Jimmy turned, backed into the base, and was greeted by a storm of dirt, spikes, shoes, uniform  and Ty Cobb. My first thought that was my friend, Austin, had been injured. When Cobb stole, he stole. But in a moment I realized [Austin] wasn't hurt... then I began to wonder if by any chance I had snapped the play." Jimmy's second season in New York was less successful than the first. His batting average fell from .231 to .218, and George Stallings, whom Jimmy had admired, was replaced as manager by Hal Chase. The new manager wanted to purge the team of players loyal to his predecessor. Accordingly, in February 1911, Austin was traded to the St. Louis Browns with second baseman Frank LaPorte for third baseman Roy Hartzell and cash. Though now 31 years old, and reaching the age when many players begin to decline, Austin's career in the major leagues was just beginning. Jimmy's first season with the Browns was his best year as a player. In 1911, Austin achieved his career bests in hits (141), doubles (25), and RBI (45), while leading the American League with 34 sacrifices. An athletic fielder who was blessed with quick reflexes and superior range, Austin also led all American League third basemen in putouts, assists, and double plays. Over the course of the decade he would lead the league in double plays three more times. In 1913, Jimmy set a career high with 37 stolen bases. During that same season, Austin served the first of three stints as temporary manager of the Browns, guiding the club for eight games in September between the firing of George Stovall and the naming of Branch Rickey as his replacement. From 1914 to 1919, he played in more than 100 games with St. Louis in each season, never posting higher than a .266 batting average, but registering a career-best .359 on base percentage in 1918, when he led the club in walks. Austin also solidified his reputation as one of the league's best third basemen, though his powerful but erratic arm caused problems. As John Kieran of the New York Times later recalled, "What an arm! Every fourth heave he made across the diamond went into the right field bleachers." Three times during his career, Austin led the league in errors. In 1920, the 40-year-old Austin became a part-time player, posting a career high .271 batting average in 83 games. Still, as J. Roy Stockton of the St. Louis Post-Dispatch reflected, "Austin, of course, can go in there any time and deliver, but his eyes cannot perform as well as his arms and hands." Jimmy became a full-time coach with the Browns beginning in 1923, but he did come back to play in exactly one game in the 1923, 1925, 1926, and 1929 seasons, before officially finishing his playing career at age 49. Austin remained with the Browns through the 1932 season, when Depression-era belt-tightening forced the franchise to let him go. He then joined the Chicago White Sox for an eight-year coaching career when J. Louis Comiskey economized and hired Austin as a "one-man coaching staff" in 1933. With Chicago, Austin continued to display unbridled enthusiasm for the game he loved. 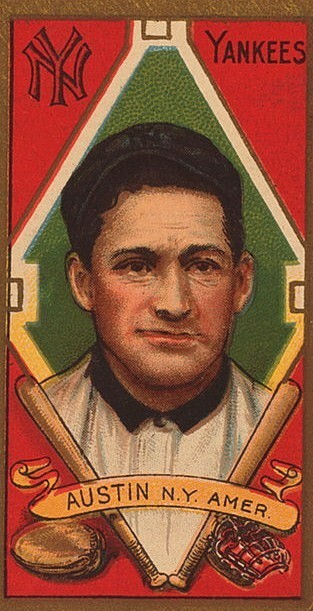 "Jimmy yells and jumps around more than any other player on the team," one newspaper reported during Austin's first year coaching with the White Sox. "He'll pitch batting practice, wipe off the balls on days the muddy field gets them in that condition, handle the catcher's glove in spare moments, hit to the infield and outfield, race to the clubhouse on an errand and chip in with countless other chores." In 1936, Austin resigned his post as a full-time coach in order to care for his chronically ill wife, Josie, but still served the White Sox as a spring training instructor. After 32 years in the major leagues, Austin finished his coaching career in 1940 at age 60. Following his retirement, he returned to Laguna Beach, California, where he had made his home since 1913. A popular figure, Austin served as mayor of the town during the 1940s. Married to Josie for 45 years, the couple had no children. After Josie's death, Jimmy remarried and retired from politics. He was still living in Laguna Beach when Lawrence Ritter tracked him down and interviewed him for The Glory of Their Times. Jimmy died before the book was published, passing away from congestive heart failure on March 6, 1965, at the age of 85. Austin was buried three days later in the Melrose Abbey Memorial Park in Anaheim, California. He and Ted Lewis, who played with Boston from 1896 to 1901, remain the only two men born in Wales to play in the major leagues. "Austin to be White Sox coach." New York Herald Tribune. February 21, 1933. "Austin Laguna Mayor." The Sporting News. April 27, 1940. "Austin Now Manages The St. Louis Browns." New York World. August 9, 1923. "Austin Quits the Feds: Former Yankee Decides to Play Again with Browns." New York Tribune, February 26, 1915. "Browns Player Never Saw Baseball Until Quite a Youngster, Having Spent His Early Years in Wales." No author, publication, or date given. Clipping from Jimmy Austin's file at the Baseball Hall of Fame Library. Harry T. Brundidge. "Jimmy Austin, with Browns for 20 Years, Forgot Rugby When Boyhood Chums Gave Him a Baseball." The Star Chronicle. February 27, 1930. "Comiskey Signs Austin As Coach of White Sox." Associated Press, February 21, 1933. Jimmy Austin. "How I Became a Ballplayer." The Evening Telegram (New York). June 20, 1913. Roger A. Godin. The 1922 St. Louis Browns: Best of the American League's Worst. McFarland & Company, 1991. George Henger. "Austin's Double Jump: The Browns Former Third Baseman Emulates the Example of Johnson, Wingo and Marquard By Rejoining the Team He Only Recently Deserted." No publication given. Clipping from Jimmy Austin's file at the Baseball Hall of Fame Library. The Sporting News. "Daguerreotypes Taken of Former Stars of the Diamond." James Peter (Jimmy) Austin. Clipping from Jimmy Austin's file at the Baseball Hall of Fame Library. "Jimmy Austin Jumps Back to the Browns." Clipping from Jimmy Austin's file at the Baseball Hall of Fame Library. "Jimmy Austin Named Browns' New Manager." New York Tribune, August 8, 1923. Ed Prell. "At 54, Austin Shows Sox Real Spirit." Chicago American. May 12, 1933. Lawrence S. Ritter. The Glory of Their Times: The Story of the Early Days of Baseball Told by the Men Who Played It. William Morrow, 1984. "St. Louis Fans Against Austin," No author or publication given. March 13, 1915. The Sporting News, June 12, 1965. Obituary. "Jimmy Austin, Old Brownie Player, Coach and Manager." "Thomas and Austin Punished For Row." New York Tribune, August 8, 1916. Untitled article with no author. October 27, 1932 describing Austin leaving the Browns as coach. Clipping from Jimmy Austin's file at the Baseball Hall of Fame Library. Untitled article with no author. March 23, 1939 describing Austin's energy as a coach. Clipping from Jimmy Austin's file at the Baseball Hall of Fame Library. Joe Williams. "When Baseball's Greatest Picture Was Snapped, Photographer Didn't Know He Clicked Camera: Hand Worked Quicker Than Mind as Ty Cobb Made His Daring Slide." New York Telegram, October 30, 1930. Clipping from Jimmy Austin's file at the Baseball Hall of Fame Library.